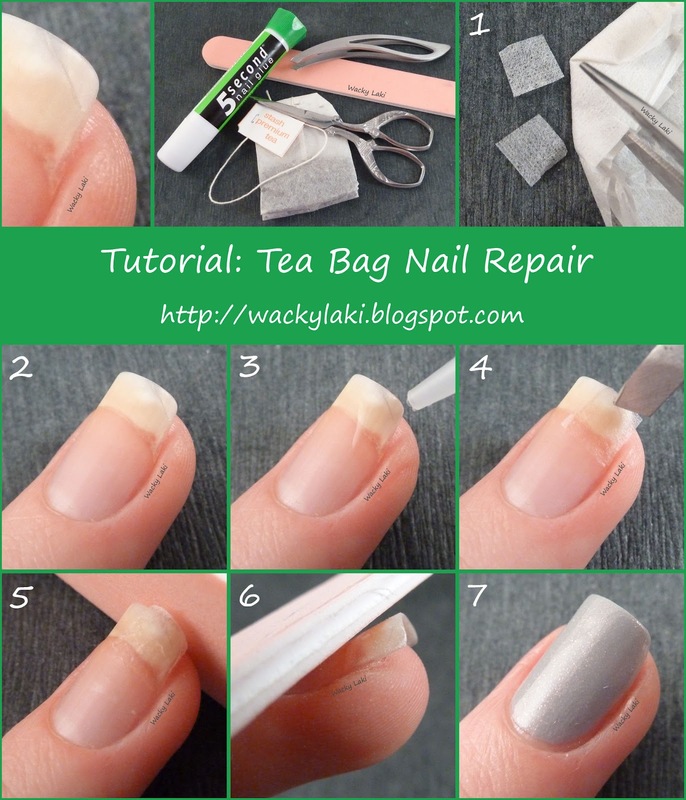 I have an impromptu tutorial for you today on how to repair a nail tear using a tea bag. Over the weekend I accidentally hit my nail on something and a corner of it was left hanging on by just a few layers. I would usually file down damage such as this, but I really wanted to keep my nail length so I chose to repair it. Normally, however, I use this repair technique for damage that is further down the nail such as a tear along the nail bed (ouch!) and it works really well. Cut out a piece of tea bag large enough to cover the damage. Clean and prep the nail. You want to make sure to remove any polish, oils, lotions, etc. Place the tea bag piece on the nail and gently press it down so it lays flat against the nail. Gently file/buff over the glue and tea bag to smooth out sharp edges. Make sure not to file down any of the actual nail or tea bag which covers the tear. Filing too much will remove the tea bag and leave the tear unprotected. Apply base coat, polish and top coat as usual and you are done! I hope you will find this useful and as always I would love to know what you think! thank you so much!!!! next time i get a tear, i will try this out! So grateful for this! I wish I knew how to do this a few days ago when I had a nasty break. I'm glad I found this tutorial and know I'm doing the repair correctly. I have one nail in the middle of a repair (a week of teabag patch) I change the patch ever third mani. and it survives the school glue base coat technique just fine. Thanks for sharing such a lovely post.........!!!!!!!!!!! Thanks for the tip! I tend to get small breaks way far down, about mid-nail. I have tried repairing them with glue, but as they grow out and come closer to the end of my nail bed, they always rip all the way off. I'll have to try this! What a great tutorial! I've had a tear on my right index finger since May that just won't cooperate, just when it's growing out it tears again! I did the teabag over that nail and I also did it on a nail I couldn't help but peel when my nailpolish started chipping.. bad, bad habit! So I put it over the weakened part of my nail to reinforce it so it hopefully won't break! Quick question--do you just leave the teabag on between manicures until the tear grows out and you've basically cut or filed that portion of the nail off? Thanks again for such a great tutorial!! I have a tear about half way across my pinky nail that if it ripped all the way the length of the nail would be half of what I waited for it to be! This trick saved me heartache and 2 more months of work! Thank you!